Svaknir is the ghost of a bard found in Dead Men's Respite. He wears a set of merchant clothes and a pair of boots. He is equipped with a honed ancient Nord sword. Near the end of the dungeon, a copy of King Olaf's Verse can be found next to his body. He is involved in the Bards College storyline via the Tending the Flames quest. 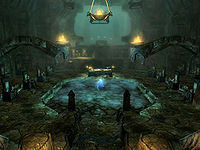 In the last room of the crypt, Svaknir challenges the remains of King Olaf One-Eye to a duel, seeking revenge for his imprisonment at the ancient High King's hands. In his part of the Poetic Edda, the living history of Skyrim, Svaknir had denounced the king as a fraud. Svaknir claimed that Olaf and his men came upon a weakened Numinex and took advantage of it to capture the dragon, and that Olaf then fabricated the tale of his battle to ensure his place as Jarl and possibly to aid in his bid to become High King. For more information, see the lore article. 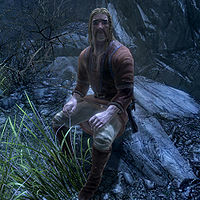 Svaknir can also be found sitting on a rock in Sovngarde during the main quest if Tending the Flames has been completed. The ghost found in Dead Men's Respite has a base ID of 00016C87 and a ref ID of 00016C88. His body at the end of the said dungeon is actually considered to be a container in game data, and has a base ID of 00018E73. Other than the verse beside it, only a few gold coins can be found on the body. The third version is found in Sovngarde. He has a base ID of 000EA57A and a ref ID of 000EA57D, and has the same outfit and weapon as his ghost. This page was last modified on 30 August 2018, at 18:29.